Solartech Universal is a South Florida solar panel manufacturer that started with a family discussion in the kitchen in 2012. Sometime in 2018 or 2019, if all goes well, they’re going to launch a ~24% efficient, 480-500W glass on glass bifacial heterojunction solar panel for the commercial and utility-scale solar market. Solartech Universal started shipping in January of 2016 and currently has 80-85MW of annual manufacturing capacity, plus they’re hiring. Recently, Solartech Universal made headlines as part of solar machine maker Meyer Burger’s heterojunction (HJT) solar cell and SmartWire (SWT) hardware announcements. Meyer Burger announced their new hardware manufacturing lines using a Solartech Universal solar panel. The ‘champion module’ hit 334.9W – a 20.5% solar panel efficiency. The cells used in the panel hit as high as 24.02% – higher than JinkoSolar’s 23.45% (albeit with a different cell type). Solartech Universal says this panel should be available in 2018 as the company works through the challenges of integrating the new manufacturing hardware into the current line (see Solartech Universal panel assembly video at end of article). The specification page for the panel family is available on the website – it peaks at 330W models, and notes being available soon. SmartWire is part of an industry wide remaking of ‘busbars.’ In order to squeeze greater efficiency from the same limited rooftop space, an evolution on the front side of the solar panel has been sped up. Solartech Universal is one of three manufacturing lines globally that uses the patented SmartWire technology (Poland, Russia, and Riviera Beach). The images above compare a SmartWire solar cell and a standard four busbar solar cell. Meyer Burger suggests SmartWire increases a solar cell efficiency by up to 6% versus a historically standard three busbar configuration, in addition to using less of the costly silver commodity. Most every manufacturer is moving toward five and six busbar configurations, and away from three. LG has rounded their ‘busbars’ and now uses up to twelve of them, defined as ‘Cello’ technology (pdf). SunPower, a long time ago, moved their busbars to the back of their Maxeon solar cell – and the Neon R Black from LG recently joined them. Shingle cell technologies that bond solar cells together in a unique ways are another attack on busbar technology. Meyer Burger is in fact discontinuing its European busbar operation and moving it closer to the region with highest demand for the lower cost technology – China. I’d suspect all manufacturers will move on this trend eventually. Meyer Burger calls heterojunction ‘the Solar Cell of the Future (pdf).’ An actual heterojunction solar cell just hit 26.6% efficiency in November. Again, well beyond, Jinko’s 23.45%. This greater efficiency is partially because of additional layers of solar material – amorphous silicon – that grabs a different wavelength of light to make electricity. In addition to pretty efficiency numbers – heterojunction’s lower production costs and fewer manufacturing steps are part of the allure. The chart below compares various solar cell types and their manufacturing steps – with the fewest steps being under the HJT (heterojunction) process on the far right. Fewer machines, less complexity, cheaper solar cells and a great upside for efficiency gains in Meyer Burger’s opinion, make this technology the real replacement for PERC (!!) solar technology that we’re just seeing hit the market in heavy volumes. The headline grabbing 24% solar panels are pictured below undergoing testing on the roof of Solartech Universal’s Riviera Beach facility. The 60 cell format – which would output in the low 410W range – is the two rooftop images on the left. And on the right is an earlier version, at 472W, of the 72 cell format that will pump out a peak of 500W. The panel will make use of both heterojunction solar cells and SmartWire technology, while also replacing the standard opaque backsheet with glass. The ‘glass on glass’ solar panel is built to take advantage of reflective ground surfaces to gain greater efficiency. Projects that demand the highest level panel efficiencies, like space constrained commercial rooftops that have installed energy-saving white rubber roofs would be the best use for a product like this. The panel, while available to be built on both the 60 and 72 cell format, will probably be delivered in the 72 cell format for commercial projects. To get to the 500W number, this panel requires a surface like a white rooftop below it. The rough math says the front side of the panel will be 20% efficient, and the backside of the panel will add about 4% more efficiency via capturing light reflected from the ground surface below. SolarWorld put together a nice document (pdf) to guide you in calculating the potential gain from a bifacial solar panel. For consumers buying panels today – Solartech’s latest residential product line, the Quantum Series is impressive both technologically and aesthetically. The SmartWire panels are aesthetically sharp with the black appearance of the thin wire technology. The 60-cell design utilizes either heterojunction or PERC solar cells – depending on product availability and customer demand, though the long-term goal is to move fully to heterojunction cells. The panel series ranges in efficiency from 17.4-18.9%. The power production of the panels is backed by a 30 year warranty, while the hardware itself is backed by a 12 year warranty. In 2013, the company bought an old boatyard – quite fitting in the Riviera Beach region – before turning it into its current 85,000 sq ft manufacturing space. The company has 45 employees currently, and is looking to expand in the first half of 2018. Currently, they’re seeking 30 more skilled workers (equipment operators and machine mechanics). The company expected a new plant to open in Puerto Rico by the end of next year, employing 80 additional workers. Construction is about halfway complete. The glass on glass commercial solar panel will be built there. The facility will have a manufacturing capacity of potentially 160MW/year. In speaking with Nathan Rosenstein, the Director of Marketing and the son of the founder, it was clear that Solartech Universal is aiming for a high quality, high-efficiency product offering. This translates to a higher cost per watt for their solar panels. Being a boutique solar panel manufacturer in an industry dominated by high throughput manufacturing in China is going to take a cutting edge product. On the company’s roof, right next to the 500W solar panel shown above, is another test facility. In it, Solartech Universal compares their 285W module to a Suniva 290W solar panel. The output of the panel ranges from 5.8% to 9.4% greater than a higher rated product. The pitch is that you’re going to get a product that performs at a higher level and for a longer time. It’s going to be tough for a company like Solartech Universal to compete. In an industry where it seems the hottest technology, PERC solar cells, is just getting going – it’s already getting pushed to be replaced by heterojunction solar cells. Keeping up with the latest and greatest is expensive. High efficiency, boutique’ish manufacturer SunPower has managed to stay alive offering a similar niche, but it has been with much pain. However, Solartech Universal is expanding and seems like they’re able to connect with some of the most advanced equipment manufacturers on the planet – Meyer Burger – to keep their technology fresh. 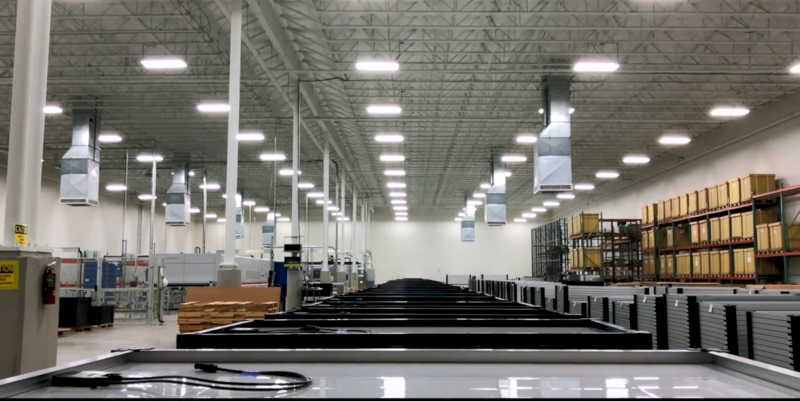 Watching the videos on their YouTube channel, and at the bottom of the article, you see that a large majority of the assembly process is automated – Solartech Universal says 70-80% of the process is automated. If the Suniva tariff does get implemented, and Trump has expressed a desire for tariffs on global solar panels, then Solartech Universal is going to get a bump in price competitiveness. One interesting thing to consider, in a world where almost all solar panels are below $1/W and all solar installation cover their costs in fewer than ten years, might it be that the high-efficiency, luxury solar panel has a much larger niche to fill? Electrek has covered solar panel bling before – and there is a space to pay a premium for panel coloring. We’ve also covered a solar flower with a dual axis tracker built into it – again, an expensive niche product, but one with a market. There are Tesla Model X buyers and Model 3 buyers – premium versus environmentally minded budget conscious buyers.